Nespresso pods espresso machine is popular among premium coffee drinkers. Their machines are not only can brew espresso but also coffee. Two of their popular machines are Vertuoline and Evoluo Deluxe. If you are in need for a coffee machine that will simplify your coffee routine, you may want to read our article below. Vertuoline is an espresso system by Nespresso. This home brewer is released for the United States market since some years ago. The machine is perfect for those who want to make their favorite espresso at home but are not fond of espresso machine, which will required more works. With this machine, you only need to insert the coffee pods and eliminate all the guesswork in espresso machine. With its Grand Cru barcoded system, Nespresso plan on targeting premium brew lovers. Not only limited to espresso, you can practically use the Vertuoline to make another coffee type as long as the machine is supporting the pods you use. Coming from Nespresso, we can expect delicious brews in every operations. However, you shouldn’t expect much when it comes from the pods variants because this machine only able to brew four espresso capsules and eight coffee capsules compared to their old line that can brew 25 capsules in total, Vertuoline sure is lacking behind. Looking form the outside, the machine comes in three colors including chrome, black, and red to suit your taste. When you look at Vertuoline, you may feel the retro vibe with its classic design. Measuring at 8.32 inches in wide, 11.91 in deep, and 11.93 in height, it is almost similar like standard K-Cup machines out there. It is not small, but also not too big and you can place it easily in any flat surface in your home or office. As it have been mentioned earlier, Vertuoline comes with Grand Cru feature that will scan the barcode located at the rim of the coffee and espresso pods to let the machine craft the perfect method for the blend. In each purchase of the machine, you will get a sample of 14 pods from variety of blend and strength. The espresso pod is 1.35 ounces and the coffee is 7.77 ounces, you may also set the machine into 0.3 to 17 oz. scale. You may also set the height to three different pouring heights including small for delicate espresso cups, medium for regular coffee mugs, and large for supersized travel thermoses. Before preparing your coffee, the machine will do preheating process for less than 20 seconds. 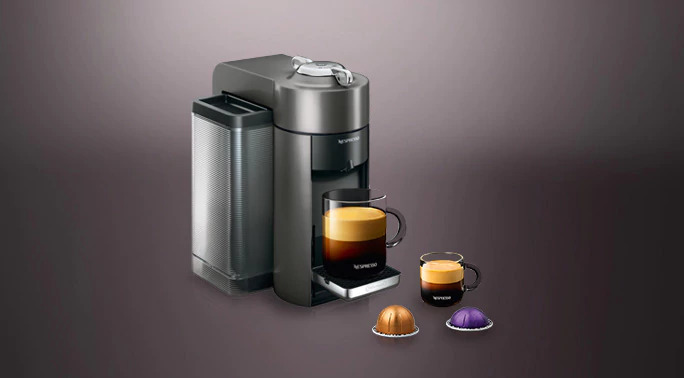 To deliver you a perfect coffee or espresso any time, Nespresso Vertuoline uses centrifusion system. Centrifusion system is the method of spinning the pod at 7000 rotations per minute to blend your pods to perfection. If you are a fan of thick crema, you may choose to add crema while the machine is making your espresso. This crema is actually one of Vertuoline boasted capability and it is proven by its rich flavor and lusciously smooth texture. For those who often forget to turn off their appliance when going out, this machine is very convenient since it will shift to off mode after 9 minutes. 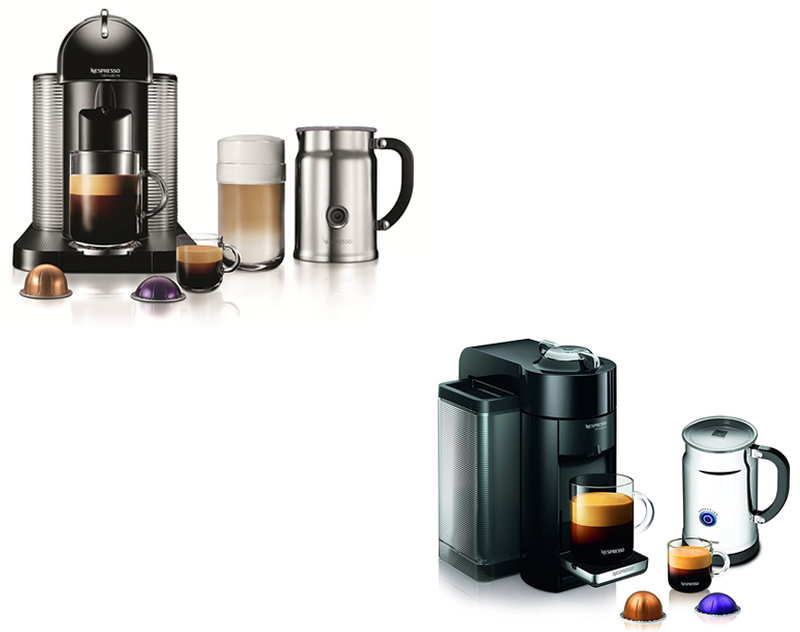 Evoluo Deluxe is also an espresso system by Nespresso. This machine is said to be the upgraded version of the Vertuoline. It is said to be taking all the best features in its predecessor and upgrading them to be better in delivering you a great result and easier to maintenance. Similar to many other similar machines from Nespresso, it not only can make espresso but also coffee depend on which pod you use. If you need similar machine recommendation, read our article on Nespresso Vertuo Plus vs Evoluo here. Unlike when brewing with manual machine, pod system will let you eliminate all the guesswork in espresso machine. Evoluo Deluxe is perfect for those who live a busy life or those who don’t want to do extra work to make their espresso. 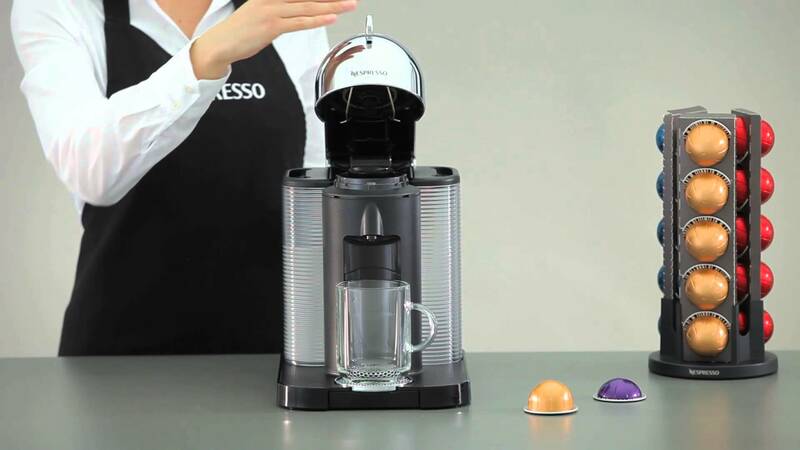 The machine is initially available in various color, but it is hard to find another color aside Black in the market.What you have to keep in mind before purchasing is when using the machine you will also be limited in the pod options, since you will only be able to use Nespresso pods. When you purchase the machine, you will get 12 pods as sample in a box of espresso and coffee assortment. From the outside, Evoluo Deluxe look very simple with plastic material to build its body and water tanks in each side of the unit. The control is located at the top of the unit and there is no complicated features or controls in the machine that will makes you confuse in your first use. Measuring 9.0 inches in width, 12 inches in height, and 12.3 inches in depth, you can practically place it in any flat surface in your home or office. Evoluo Deluxe comes with centrifusion system, which means it will spin your coffee or espresso pods up to 7000 rotations per minute. This method is used to mix your blend and create the best result you can get in each pod you use. Centrifusion is also used to create the rich crema you love for authentic rich taste espresso in every brew. Another boasted feature in Evoluo Deluxe is the Grand Cru intelligent extraction system, which will scan the barcode in each pod’s rim to make the machine blend your pods in exact adjustment. As it have been mentioned earlier, you can choose between espresso or coffee; espresso will make you 1.35 oz. liquid while coffee will get you 8 oz. liquid. You can easily differentiate the pods since the pods for coffee will be larger than pods for espresso. Evoluo Deluxe pre-heat itself for about 15 to 20 seconds before you can use the machine and you may also set the tray to match your cup size. Now, let’s compare Vertuoline and Evoluo Deluxe. The basic features of both machines are actually the same. They come with the same centrifusion and Grand Cru system to scan each pods used. However, Evoluo Deluxe is able to create better crema than its predecessor and the auto eject feature also available to ease you when disposing the pods. Another difference is the water tank capacity, since the Evoluo Deluxe is larger in size, it also comes in larger water tank. All in all, the decision is all yours to make. From the features side, Evoluo Deluxe is definitely better. However, the upgrade is still too little to set them apart from each other significantly. In our opinion, if you want to pick one of them, Evoluo Deluxe will be a great choice.